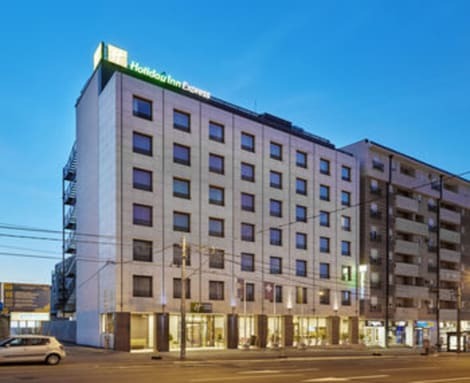 Stylish central Belgrade hotel with bright meeting rooms and breakfast included Holiday Inn Express® Belgrade - City is a 10-minute drive from the city's historic district, and there's a bus and tram stop right outside. You can walk to the Museum of Nikola Tesla and St. Sava Basilica in just 15 minutes. 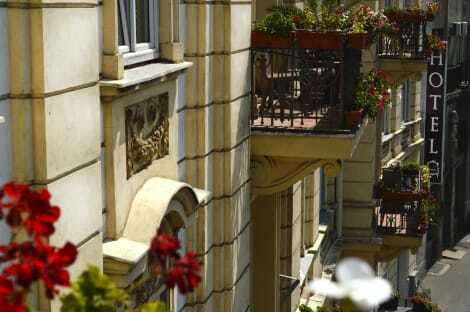 Then visit any number of artsy bars, restaurants and antique shops of the bohemian Skadarlija. Roman-era Belgrade Fortress is also within easy reach. Travelling on business? Conventions at Belgrade Fair and Sava Centar congress centre are just under 20 minutes' drive away. Alternatively, the hotel welcomes you to plan an event in 2 sunlit conference rooms with space for up to 70 delegates. At this hotel you can enjoy: - Free WiFi throughout - A Business Centre - Covered parking - A relaxing courtyard decorated with creative street art Choose a standard guest room or interconnecting rooms specially designed with the family in mind. Whichever you choose, a pillow menu, coffeemaker and satellite TV are here to make you feel at home. Spacious desks make it easy to spread out and get your work done. Start your day with the included Express Start Breakfast buffet, and catch up on the latest news or sporting events on TV while enjoying a light snack or a nightcap at Roosevelt Bar. The hotel is located in the city center just opposite the City Hall and Parliament building. Surrounded by the Pionirski and Tasmajdan parks, it is within a short walking distance from the main city squares, all major embassies, theaters, old bohemian quarter Skadarlija, Knez Mihailova Street, Kalemegdan fortress, renowned restaurants and clubs. The hotel has 73 smartly furnished rooms and suites, cozy and comfortable restaurant and lobby bar, and a banquet hall. Featured amenities include a 24-hour front desk, a safe deposit box at the front desk, and an elevator (lift). A roundtrip airport shuttle is provided for a surcharge (available 24 hours). Head straight for the casino, or wait for that lucky feeling while you enjoy one of the other recreational opportunities, such as a fitness center. Additional features at this hotel include complimentary wireless Internet access, a television in a common area, and tour/ticket assistance. A stay at Kopernikus Hotel Prag places you in the heart of Belgrade, within a 10-minute walk of Knez Mihailova Street and Republic Square. 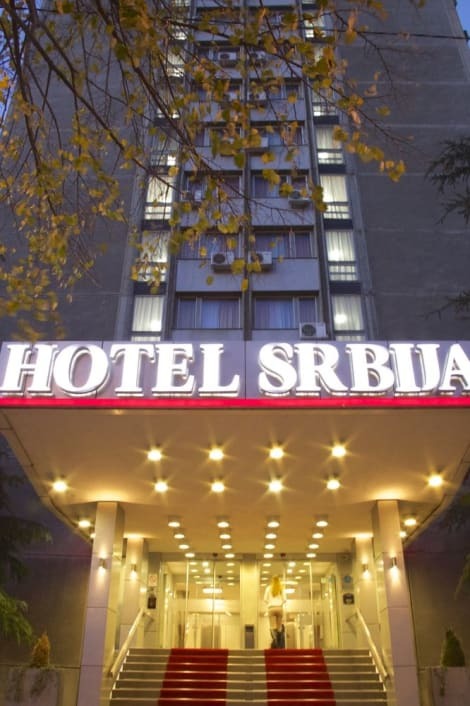 This 4-star hotel is 0.7 mi (1.1 km) from Trg Republike and 0.7 mi (1.1 km) from Nikola Pasic Square. Make yourself at home in one of the 49 air-conditioned rooms featuring minibars and LCD televisions. Your room comes with a memory foam bed. Complimentary wireless Internet access keeps you connected, and digital programming is available for your entertainment. Private bathrooms with showers feature complimentary toiletries and hair dryers. Featured amenities include wired Internet access (surcharge), a business center, and complimentary newspapers in the lobby. A roundtrip airport shuttle is provided for a surcharge (available 24 hours), and free self parking is available onsite. Make yourself at home in one of the 39 individually decorated guestrooms, featuring minibars and LCD televisions. Complimentary wireless Internet access keeps you connected, and cable programming is available for your entertainment. Private bathrooms with showers feature complimentary toiletries and bidets. Conveniences include phones, as well as safes and desks. 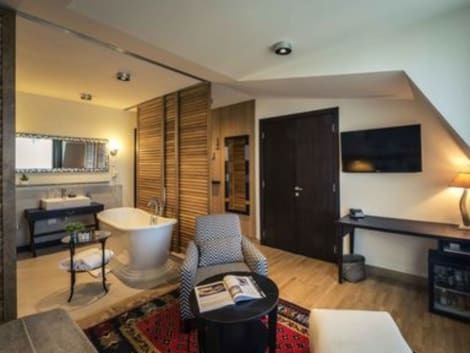 With a stay at Belgrade Art Hotel in Belgrade (Stari Grad), you'll be steps from Knez Mihailova Street and 3 minutes by foot from Republic Square. 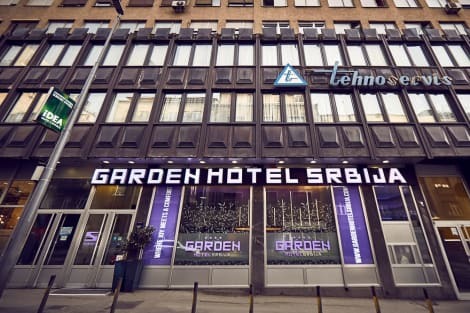 This 4-star hotel is 0.4 mi (0.7 km) from Belgrade Cathedral and 0.6 mi (1 km) from Trg Republike. Make use of convenient amenities such as complimentary wireless Internet access, concierge services, and babysitting/childcare (surcharge). Additional amenities at this hotel include wedding services and a television in a common area. Guests can catch a ride to nearby destinations on the area shuttle (surcharge). Featured amenities include a business center, limo/town car service, and express check-in. This hotel has 9 meeting rooms available for events. A roundtrip airport shuttle is provided for a surcharge (available 24 hours). One of the oldest cities in Europe, Belgrade is the capital of Serbia, and the country's largest city. With evidence of a long and chaotic past wherever you look, the city is moving rapidly towards a bright future, and is now a top tourist destination. Belgrade has an immensely long and varied history, dating right back to the 4th century BC, when the area was settled by Celtic tribes. Later on, it became the Roman city of Singidunum, and splendid relics of that era can still be seen in the city today. Through the Middle Ages, Belgrade became a Serbian stronghold until the Ottoman invasion. The city changed hands between the Ottomans and the Austrians several times until 1878, when Serbia obtained its independence, and Belgrade finally became the capital. With such a long history, visitors don't have to spend long in the Belgrade area before stumbling upon a fascinating building or museum. The Kalemegdan Citadel is impressive, and it's easy to understand why over 115 battles were fought over it, destroying it over 40 times throughout the centuries. Building began in the time of the ancient Celts before the Romans extended the build onto the flood plains during the settlement of Singidunum. One of Belgrade's best museums is the Nikola Tesla Museum, dedicated to honouring the life and work of the great inventor, Tesla (1856-1943). He was a futurist, best known for his contributions to the design of the modern alternating electricity supply system (AC). Tesla's ashes are kept here in a golden sphere, his favourite geometrical object, and visitors can also see many of his patents including the famous Tesla Coil. Other places of interest include Skadarlija – a vintage street, The National Museum, The National Theatre, Nikola Paši? Square, Knez Mihailova Street, The Church of Saint Sava and The Old Palace. 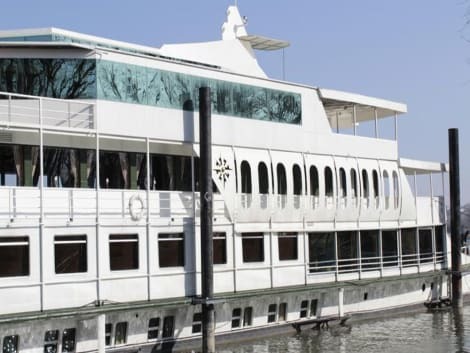 There are also many parks, monuments, museums, cafés, restaurants and shops on both sides of the river. The hilltop Avala Monument and Avala Tower – which is the Monument to the Unknown Hero WWI memorial, also offer beautiful views over the city. Belgrade is the site of many annual international cultural events, including the Film Festival, Theatre Festival, Summer Festival, Music Festival, Book Fair and the Beer Fest. Much of Serbia's film industry is based in Belgrade, and FEST is perhaps the most well know festival, an annual film festival held here since 1971, having presented over 4000 films since that time. Belgrade has a great number of cuisines on offer. Traditional Serbian restaurants offer delicious food, and diners are often accompanied by musicians who roam from SEOSITE_LEVEL_DESCRIPTION to SEOSITE_LEVEL_DESCRIPTION. Chinese, Italian, Japanese, French, Greek and Mexican are just some of the other international cuisines on offer in the city. Try Salon 5 for a romantic Italian meal for two, or perhaps Casa Nova for some French cuisine. Zavicaj Restaurant and Mala Fabrika both offer some fabulous traditional Serbian dishes in an authentic location. For pudding, take a stroll to Moritz Eis for some of the best ice cream in the city.